Cool Hand Luke may be a prison drama; all the same, you are going to have a helluva lot of fun watching it! It’s my favourite Paul Newman film and one of his finest. It’s got more heart than almost any other movie I can think of. Once you’ve seen it, the story and images stay with you forever. Don’t miss this classic. You don’t just get Paul Newman; there’s George Kennedy in a supporting role which won him his only Oscar. There are Dennis Hopper and Harry Dean Stanton in early feature film roles. And there is the rest of the absolutely superb supporting cast. 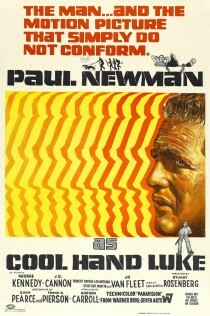 Cool Hand Luke: One of my all-time favourites. As always, we recommend you don’t ruin any surprises by reading spoilers or watching trailers. But, of course, we include them here for those of you who can’t keep your mitts out of the cookie jar. Hey, Shimky, I didn’t know Lalo Schifrin did the music on this too. Great theme composer. I’m going to check it out. I couldn’t agree with you more! I recently wrote a post about CHL. I’d love your comments! Hello Shimky, love your website. CHL has been my favourite Paul Newman movie since I was a teenager. Thanks for sharing! Always loved Paul Newman! I do think that I like his lighter fare like “The Sting.” I also liked his times as a P.I. and as a bank robber. He was on my attic ceiling wall with Robert Redford in “Butch Cassidy and the Sundance Kid.” I blame those two for my love of bad guys! Thanks for the great review. I watched this recently due to my psychology professor mentioning it while we were studying about the Standford prison experiment, and seeing its poster in the movie 25th Hour. Great movie! Introduced me to Paul Newman (haha, I’m still a film noob). One of my all time favourites. Funny but sad and wonderfully acted. Nice review. Yeah I liked this one too. For another classic prison drama that is perhaps a little less humourous, try Sam Peckinpah’s “The Getaway” with Steve McQueen. The opening scene is some seriously brilliant film work. Can’t say much about the rest without giving it away. It’s enough to say Peckinpah doesn’t let the viewer off easy. Well said. One of those most memorable movies I have ever seen. Along with To Kill a Mockingbird. I always referred to my boss as “boss.” He assumed that I had seen Cool Hand Luke. Eventually he threw a “what we have here is a failure to communicate” and I didn’t get it. He leant me the DVD the next day. Awesome performances all around. Have seen this many times… great movie! My favourite Paul Newman film!